My niece is in college getting her teaching degree, and she is a nanny this summer, so I have a new source of fun projects. Thanks for this Jenn! She tries to do something fun with the children she takes care of everyday and she shared a couple of projects with me. Her first project was salt dough. And guess what, you don't NEED to cook with the salt dough. I have not made this. She gave me her final creations as an example, but she said the kids had a good time. Mix all the ingredients in a large bowl. If the mixture is too dry, add water by the teaspoon until it reaches a nice consistency. Then allow the children to play. The dough can be wrapped in cellophane and saved in the fridge for two weeks. 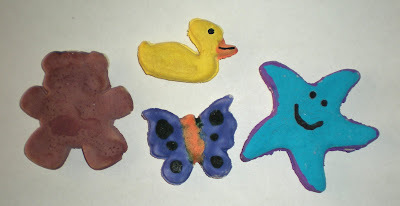 After your child has made the creations, place them on a baking tray or cookie sheet. Bake them in the oven at 350 degrees for about 20 minutes. After they have cooled you may decorate with tempera paint, acrylic paint, or even markers. She has a paint listed that you add 1 part white glue to 2 parts paint. This will make it shiny and tough. You can also glue other objects such as sequins, buttons, glitter, pom poms, etc., to make a final fantastic creation. This is one of our favorite activities... so much fun! I've never tried using markers on them. Great idea! Cute and fun. Perfect with Christams coming up as children can make some sort of festive decoration to hang on the tree. It would be fun to use the decorations year after year and add to the collection. We did these when I was little, I loved them! Thanks so much, I'll be linking. I can't wait to see what other projects she does-what a fun job!